The intermingling of poetry and Irish music created an atmosphere of captivation, reflection, and joy. This past Saturday night marked Wake Forest University Press’ first Wake Up to Poetry Celebration. In honor of National Poetry Month, WFUP collected student submissions, receiving more than 50 poems. The submissions were then evaluated by award-winning poets, Adrian Rice, Rachel Richardson, and David Roderick. At Saturday’s event the student winners Baily Pittenger, Mackenzie Connollee, Jessica Whitehair, and Kory Riemensperger read their winning poems. Not only did I awaken to some truly thought-provoking and powerful words from my peers, but I also had the privilege to hear the works of the three award-winning judges. 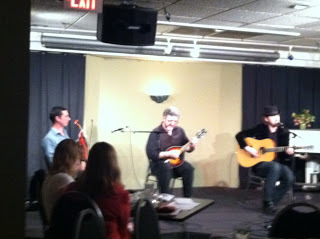 Although I went to the Community Arts Cafe Saturday anticipating a night filled with insightful poetry (of which there was a multitude), I also had the shear pleasure of listening to The Belfast Boys, a traditional Irish duo from Hickory, NC including judge Adrian Rice and his musical partner Alyn Mearns. Rice’s delicate mandolin playing and Mearns’ lilting vocals created an intimacy almost tangible within the space. Their reinventions of traditional songs including an eight-minute long rendition of “Danny Boy”, ushered a silence over the crowd, bringing all the beauty of traditional Irish music to NC. Saturday night was a unique experience that brought the community together in a celebration of poetry and music. It was an event that united a diverse group of people including student poets, seasoned poets, poets for social justice, and local and renowned musicians. WFUP looks forward to making the event annual in hopes of bringing together even more people in such a positive environment for artistic expression. If I took one thing away from Saturday’s event it was that poetry matters. Not only is poetry an exploration of self and soul but it (not unlike music) has a universalizing power that brings people together. Categories: Arts and Culture, NewsTags: Adrian Rice, Belfast Boys, Community Arts Cafe, interns, National Poetry Month, Wake Forest University, Wake Up to Poetry!